Monopartite, linear, dsDNA genome of 134-248 kb. The genome contains terminal and internal reiterated sequences. 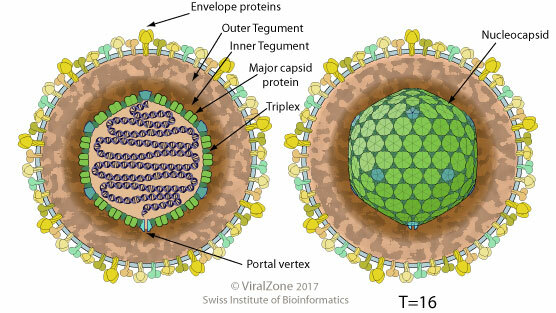 Each viral transcript usually encodes a single protein and has a promoter/regulatory sequence, a TATA box, a transcription initiation site, a 5' leader sequence of 30-300 bp (not translated), a 3' non-translated sequence of 10-30 bp, and a poly A signal. There are many gene overlaps. There are only few spliced genes. Some of the expressed ORFs are antisense to each other. Some ORFs can be accessed from more than one promoter. There are some non-coding genes.